Skirt Board: 2×6 Treated around bottom of building. Roofing & Siding: Painted 29 GA. Steel, 40 Year Metal Roof and Sides with Trim Package. Misc. Siding: 2′ High Clear Panels on (2) 32′ Eave. Roof Overhangs: Overhang boxed-in w/ white vented soffit w/ painted fascia trim: 12″ Sidewalls, 12″ Gable Ends. 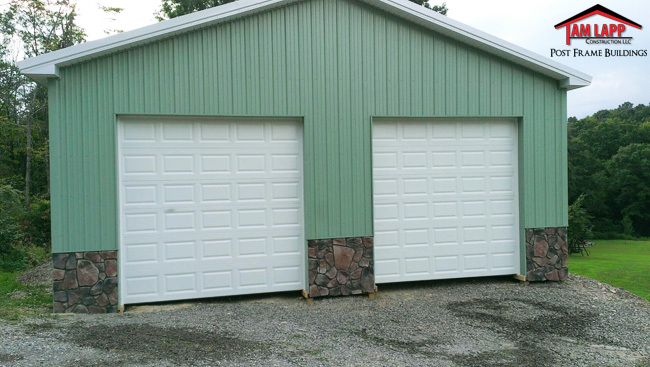 Clopay Garage Doors: (2) 10’W x 10’H White Raised Panel, Insulated w/ Inside Locks. Misc: Stone Veneer Done By Customer. Colors: Charcoal Roof, Patina Green Sides, Bright White Trim, Patina Green Trim. I finished the stone on Saturday evening. The building turned out great! We are very pleased with how it turned out. The guys were extremely quick and very friendly. We plan to pour concrete in the fall. I would be more than happy to give a reference anytime.